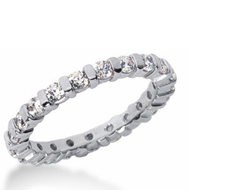 Eternity bands signify everlasting love with diamonds that surround the wedding band. 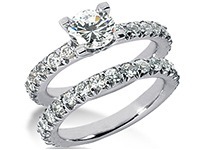 We want to offer our clients the widest variety of selection in diamond sizes, settings, and shapes along with ensuring the highest value and quality of diamonds. 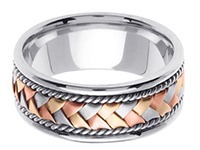 Eternity bands can differ from one another in various ways, but rest assured, you can trust that the splendor and elegance of this ring style is sure to make a lasting impression on all who witness its beauty. 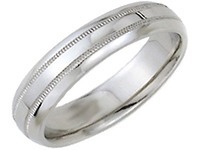 An Eternity Band differs from all other wedding bands as brilliant and radiant diamonds are set along the entire ring. The silhouette of diamonds hand set in this magnificent masterpiece truly emphasizes the power of everlasting love; love for eternity. 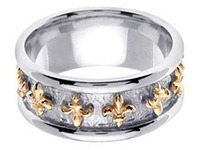 This ring illustrates and highlights the many ways to truly capture the essence of endless love, and the perfect way to say forever. 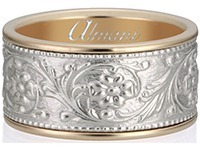 There are three important factors that are critical in selecting an eternity band to determine the appearance, clarity, and extravagance of the beautiful wedding band you select. 1. First, you should know which diamond setting you prefer. 2. 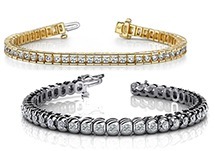 Next, you should decide on what diamond shape suits your style. 3. 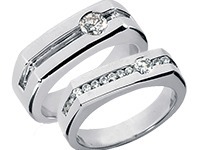 Finally, you should select the suitable clarity and color of the diamonds in the ring you want. 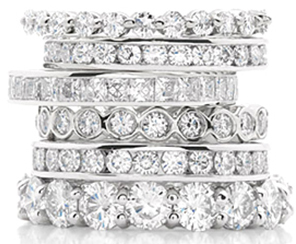 Diamond settings help set the foundation for the type of eternity band you select. 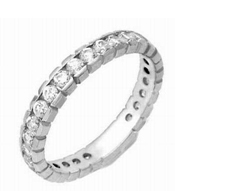 Below you will find various types of settings for eternity bands with their characteristics. 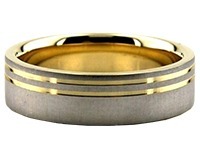 Read thoroughly to select which setting is the proper fit for your liking. 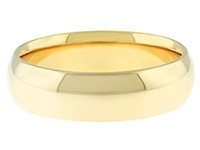 The channel setting describes diamonds that are aligned in a channel between two pieces of either gold or platinum. 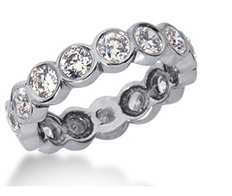 The diamonds are strategically placed inside this setting with no precious metal in between the stones. 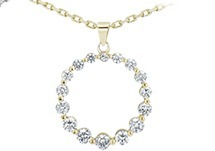 Furthermore, the diamonds are set flush to the precious metal which prevents the diamonds from getting caught onto clothing and offers a smooth surface. 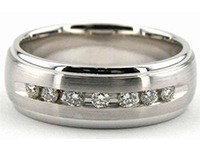 Because of the placement of the channels the light that normally reflects through the diamonds is slightly dimmed. 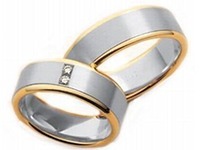 Channel setting eternity wedding bands continue to be a widely popularized setting choice when choosing diamond eternity bands and engagement rings. Prongs that hold the individual diamonds are placed strategically along four or six points around the diamond securing it into place. 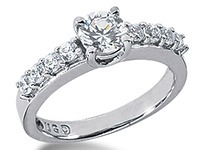 The prongs are slightly raised above the diamond to safely grasp the stone and elevate it into the air. 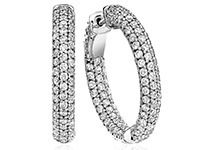 This allows for the greatest amount of light to shine through to the diamond which gives off brilliance, shine, and luster. The light that shines upward through the diamond from the bottom portion (culet) to the top (table) will allow for maximum brightness. 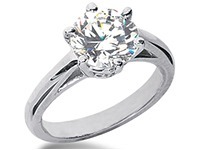 The shared prong setting is similar in mechanism to the prong setting, only instead of having four or six prongs to hold the diamond; the shared prong setting does as its name suggests, shares two prongs between the diamond’s setting. 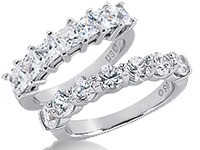 Every two diamonds with a shared prong setting have individual prongs on one side of the diamond and share two prongs in between. 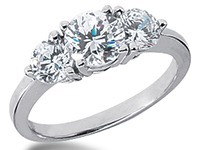 This setting is used to further enhance the look of the diamond rather than the prongs. 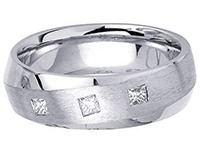 The Bar setting bears a resemblance to the shared prong setting, but instead of prongs there is a solid bar in between the diamonds that separates the stones. 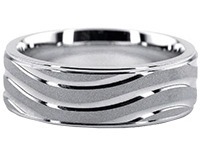 The bar setting highlights the combination of both precious metal and diamonds in harmony along the eternity band. 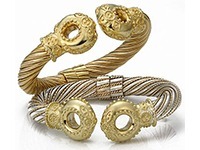 The appearance of the gold or platinum selected is evident in this setting without overpowering the effect and sparkle of the diamonds. The box setting refers to a box shaped glove that cups the ends of the diamonds that are set side by side. Each diamond is set without gold or platinum in between them. The setting is created so that the diamonds sit close (flush) to the setting which prevents snags with other materials or getting caught. 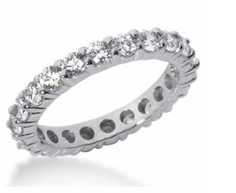 This setting allows for a fair amount of light to shine through to allow for more luster and shine of the diamonds. 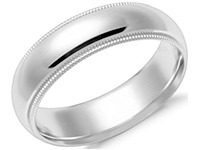 The bezel setting is highly distinct from other settings as this setting creates a border around each diamond and takes the shape of the diamond and surrounds it. Because this setting is not elevated with prongs, it sits lower on the finger and is recommended for individuals that are more active with their daily activity. 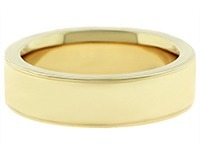 The bezel setting provides more protection than a prong setting. One thing to note is that the bezel setting does not obstruct the view of the diamond contrary to popular belief; rather the light that enters the diamond enters from the top that is not hindered by this setting. 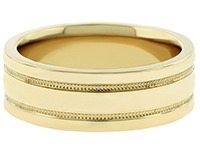 Also this setting prevents dirt and other imperfections from entering the setting and clouding and polluting the diamond. 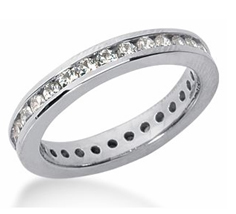 When selecting an eternity band, important features that determine the quality include the diamond color and clarity. 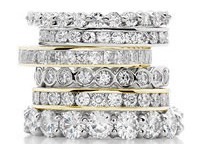 We here at Wedding Bands Wholesale understand this factor and are proud to begin our standard for our handpicked diamonds at G color and VS clarity and higher, along with ideal to excellent cut. The cut of the diamond reflects the brilliance, shine and radiance that the diamond emits once light hits it. The color of the diamond refer to the actual color of the diamond on a grading scale with letters higher up on the grading scale closer to D reflecting a colorless – bluish tint whereas further down on the grading scale refers to a more yellowish tint. Clarity refers to the amount of imperfections that can be seen with the naked eye when examining diamonds. 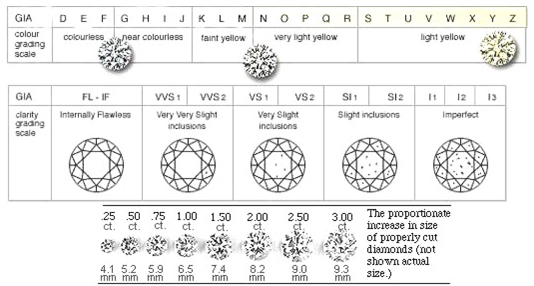 The diagram below will help choose color, clarity, and cut of the diamonds you are selecting.